Half French, half Scottish, I live and work in-between these two countries, cultures, languages, and ways of seeing and thinking even. 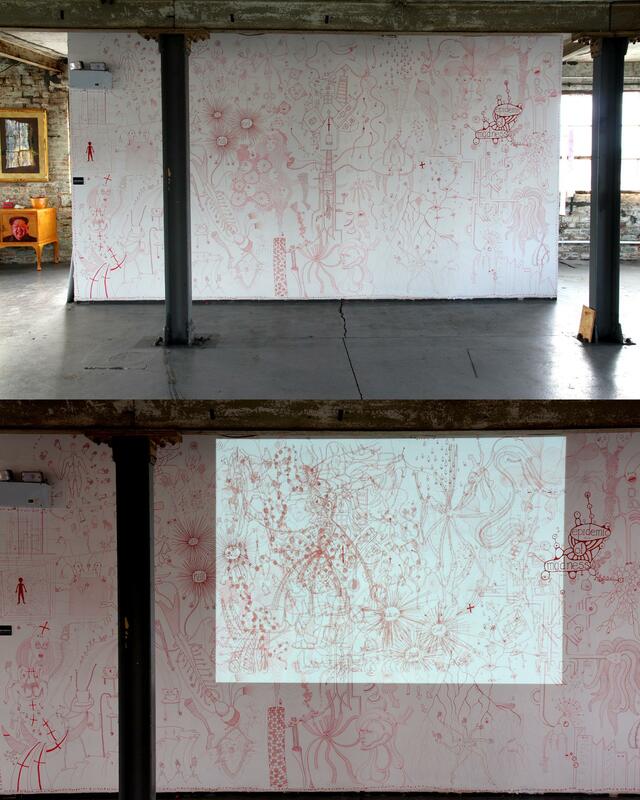 My work explores different forms of (with)drawing, in two complementary forms: hundreds of small drawings on paper ; and, large-scale “alternative” drawings (collective wall-drawings, performance-drawings, live drawing in theatre…). My research explores different forms of (with)drawing, in two complementary forms: hundreds of small drawings on paper ; and, large-scale “alternative” drawings - semi-automatic wall-drawings, durational performance-drawings, the construction of a (with)drawing bothy... All my production stems from my work protocol, based on my daily drawing practice, notably making one drawing per day, a small, secret, diary drawing in a notebook which I then transform into a further drawing through processes of enlargement, translation and repetition. They are presented in narrative clusters, and make connections in all directions, in a delirious, rhizomic structure, where each individual drawing can be moved to be part of another cluster which gives it new meaning. My subjects : the ordinary (part-)body, human, animal or otherworldly, altered, twisted or gone wrong ; and repetition through growth or patterns, geometric, vegetal or organic. Rooted in the ordinary (gone a bit wrong), my drawings strive towards an “othering” of the everyday, the strangely familiar or « uncanny ». My drawing has to do with blindness, it has no interest in representing anything seen, but rather echoes the wrongness/madness of the world. My most recent research concerns long-durational performance-drawing which consists in working intensely, (with)drawing for several hours per day in a methodical drawing activity. Through this kind of on-going private performance I am interested in the way that drawings, even when made in isolation, still comprise a performance aspect to them, especially when they are made in this long, repetitive, ”semi-automatic” way which demands a certain withdrawing. 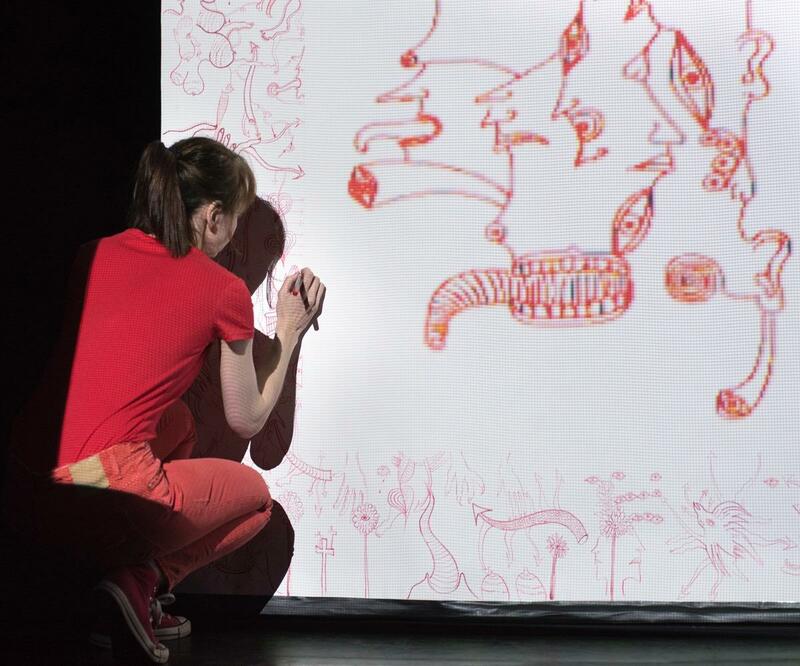 Collaboration is also a recent development in my work : with theatre-maker and writer Annie George, to make Twa, shown at the Edinburgh Fringe this year, I created a series of projected animated drawings and made performance-drawings live on stage ; and through large-scale collective drawings, made with other artists and the public. For me all this is about creative resistance : a « slowly but surely » way of resisting the everyday through a creative act. It is a way of linking aesthetics and ethics, art and life, a way of producing yourself. For me this takes the form of “(with)drawing”: drawing to the point of withdrawing. I am interested in the idea of excess, of pushing to the limits, not far from the absurd or even a form of madness as an alternative to imposed conventions. I created an installation with a one-mile long red cord which I French-knitted, a 3D drawing in space. 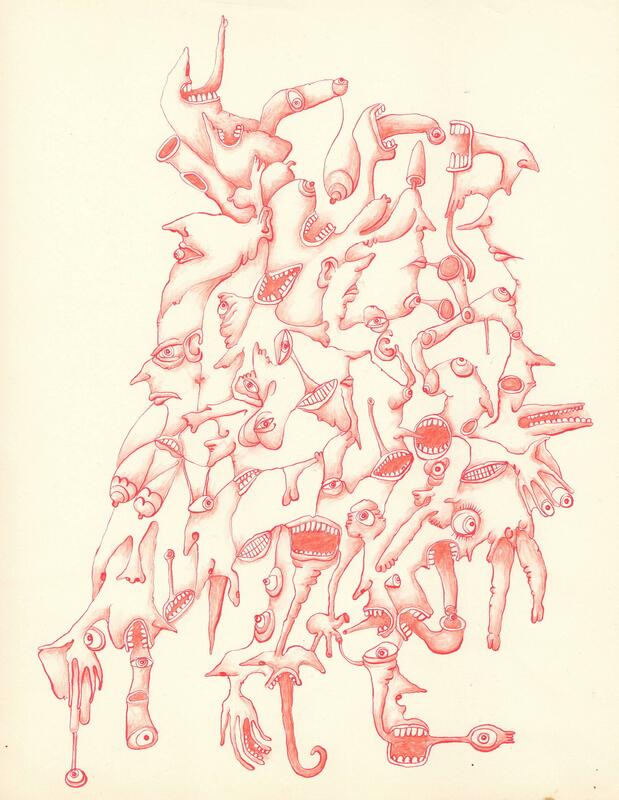 Meandering from the outside courtyard, luring the spectator inside, this “drawing” evokes Ariadne’s red thread. Introspective, this was an exploration of the creative process itself and questioned artistic identity, and it was in the wake of this experience that I took the decision to concentrate solely to my drawing practice, up until then a hidden, secret activity. Through theatrical storytelling and projected animations and live drawing, two contrasting stories about women who are silenced and who discover other means of expression besides the voice to convey their truths are unwound.